Confession: I’m a coconut oil virgin. They sent me this huge jar of coconut oil for work and beyond scooping a tiny bit out to rub on my elbows, I haven’t been brave enough to do anything with it. I know that y’all are doing everything under the sun with this stuff, from curing diaper rash to adding it to your coffee, but I need HELP and I’m pretty sure (I hope) that I’m not the only one who is just jumping onto the coconut train. 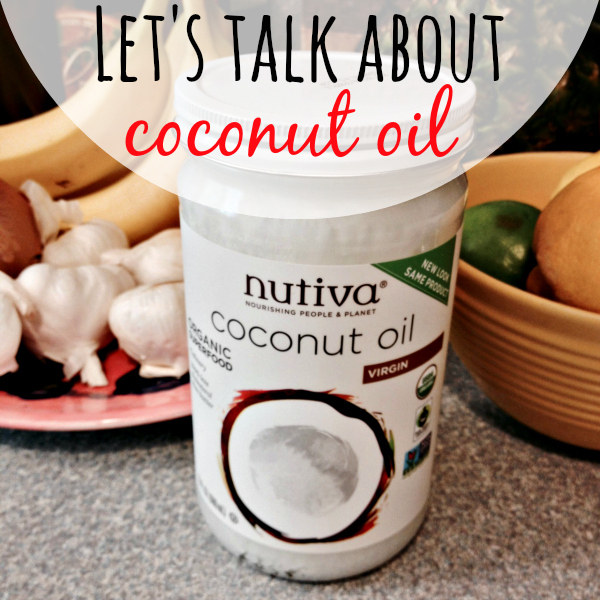 What do you use coconut oil for at home and in the kitchen? I need specifics! If you put it in your coffee, how much do you use? Does it melt? What about when you cook? Do you use it just like you would olive oil? What is your favorite beauty use? Do you ever put it on your hair? I want to hear it all. Educate me, coco-nutty friends! The coconut oil was sent to me by the non-profit organization Fair Trade USA via Klout. All coconut-related opinions are my own. This entry was posted in Life and tagged 2014, Coconut Oil, Klout Perks on May 20, 2014 by Katie Kavulla. What don’t I use it for!! Curing my babies cradle cap, cooking chicken (use like you would use olive oil), baking (substitute it for when a recipe calls for oil), facial moisturizer (and I have oily skin and it doesn’t make it too oily), body moisturizer, in the dry winter on my hair and the ever popular swishing. I “whipped” some up with a mixer with some lavender oil and it’s the best body moisturizer. I love coconut oil and a little goes a LONG way. I bought two 16oz jars last summer and they both have tons left. I add a teaspoon to my oatmeal in the mornings, rub it on my cuticles and elbows, and sometimes use a small amount on my hair to tame the strays. But have NOT added to coffee yet! I use that same concoction as hair product- maybe 1/8 teaspoon? It holds a light curl, and it’s definitely better for your hair than all the chemical-y stuff. I also make popcorn in it (using a Whirlipop), it adds the faintest bit of sweetness, and with salt and maybe a light dusting of sugar (and butter) it’s pretty damn good. It’s also nice as a substitute for oil or butter when frying pancakes- the coconut adds a nice flavor. I don’t use it when I’m making savory dishes (like stirfry) because the flavor is too strong. I use it to replace butter in baking pretty often, cook everything in it, as a general purpose skin moisturizer (though not for my face, it’s too heavy), baby skin care, It even works great as a hypoallergenic lubricant. It’s the handiest oil ever! Though I think you should probably keep separate jars for each purpose….